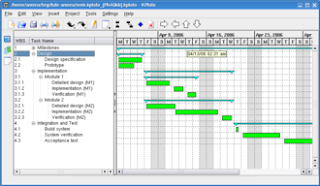 KPlato is a standalone desktop project scheduling software that is provided free. We provide a desktop category rating of 3/5. Gantt chart with task list and resource allocations per task. Resource view with task allocations per resource. Accounts view showing planned cost with configurable cut-off date and periodicity. Tasks are organized in a work breakdown structure (WBS). Resources are organized in a resource breakdown structure (RBS). Accounts are organized in a cost breakdown structure (CBS). Resource leveling. Resources are just allocated to the requested task even when allready booked to other task(s). The resulting conflict must be resolved manually by adding task links or constraints to avoid parallel scheduling of the tasks. Project execution and follow up.